It is the one that can be produced because of me, the perspective of the world that can be created only by me. 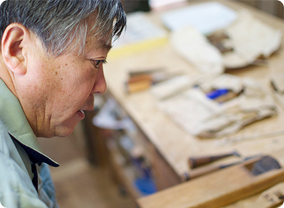 They are artisans of Hasuda continuing production of articles through the skill they have hitherto acquired sacrificing years of their life. Philosophical construct is shown in their manufacturing manner. As we come to know the artisan’s life style and the way of thinking, we may be able to solve why they are continuing production. 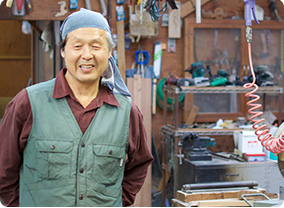 HEAD OF "Takakiyo ATELIER" ORDER-MADE FURNITURE MANUFACTURING He worked at a shop handling furniture and equipment for famous hotels for 20 years building up his skill and then he stood on his own feet. 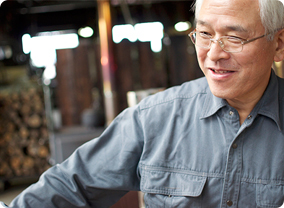 After independence, he has been engaged in producing furniture and wood articles made to order one by one for more than 20 years. FELT ARTIST She was attracted by potentiality of felting art and set foot into the world of NEEDLE FELTING, enjoying a good reputation for her own distinctive work style seeking reality. Her unique and creative works are displayed at "GENTEN" (Renowed Contemporary Art Exhibition) held in The National Art Center, Tokyo Every year. 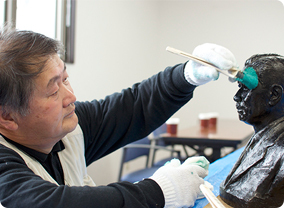 HEAD OF "CAPITAL ART" He offers elaborately-wrought products centering illumination and objet as well as restoration and maintenance of bronze statues making the most of his forging technology. HEAD OF "ATELIER Daigoro" FOR HEARTH, UNIVERSAL POTHOOK, HIDANA (FIRE RACK) Making good use of woodworking technique attained through his carpenter works, he produces shrines, hearthes, etc. which have come down from Japanese building structure of ancient times in accordance with customers' requirements. 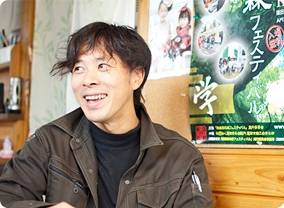 HEAD OF "SHOBUNRO (WOOD STOVE) ATELIER" He started manufacturing wood stoves in 2006. He makes wood stoves by hand one by one disassembling old machine tools. HEAF OF "AIR BRUSH ATELIER" EXCLUSIVE FOR MURALS AND LUMINESCENT PICTURES PAINTED BY MAGIC BRUSH Making unique arts of warm and soft texture in accordance with customers' requirements, offering a wide range of services from colorful pictures to chic pictures using color tone technique accumulated through his experience of automobile sheet-metal processing. 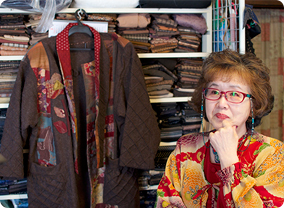 HEAD OF "ATELIER Chieko" FOR WOMEN'S CLOTHES AND CREATIVE CLOTHING She studied sewing alone from her childhood, making creative apparels of high originality featuring special color usage based on the red and toughness. She has many deep-rooted fans.